It can often be discouraging to participate in a real food renaissance that seems to go unnoticed by the majority of our surrounding culture. I, too, felt the frustration that Joel Salatin expresses so eloquently in a recent article. Mothers, THANK YOU! Thank you for waiting half an hour for your toddlers to put their shoes on and get their jackets on so that you can go pick up your farm food. Thank you for bringing it home and lovingly fixing your family a nourishing meal even though the kids are whining and you’d much rather be sleeping. I remember vividly when my tired mother buckled her four young children into the car and drove miles away just to stack our old newspapers in the recycling trailer at the library. It didn’t make sense to me at the time, but it is because of her and others like her that we have curbside recycling today. You are changing the world! And you are my hero! Students, THANK YOU, thank you for spending the extra bucks to buy the healthy meats, the good milk and eggs even through you’re broke. I’ve heard your stories, shared tears with you over your health challenges, empathized with your convictions, watched you as you speak out for what you believe in, but, more importantly, put your blood, sweat and tears into your beliefs. You are changing the world! You are my hero! Grandparents, THANK YOU, thank you for helping your families, reading the literature, taking care of your grandbabies and providing them the nourishment their young bodies need even though their parents are too busy or too burned out to do the research or spend the extra money. I’ve heard your concerns about your babies, the environment, the economy. Your heart is committed and you want to leave your grandchildren a healthier world than what is on the horizon. You are changing the world! And you are my hero! Bachelors, young professionals, religious leaders, and everyone else who doesn’t fit into a neat category, THANK YOU, thank you for taking seriously your own health for whatever private or not-so-private reasons you have. Thank you for choosing to support sustainable farmers, local economies, and the local co-ops. I watch as you carefully learn everything you can about food, farming and then watch as you begin to apply it, gently leaving behind the co-ops, the CSAs, the raw milk underground as your garden grows and you learn how to produce all your own and then invite us to share in the abundance. You are changing the world! And you are my hero! Every time each of you chooses to support the system of local, ecological farming or nourishing, traditional foods and holistic wellness, you are choosing to contribute to an abundant, healthy and prosperous future! I sincerely and deeply THANK YOU for your choices. You are my hero! Together we are creating a new future! 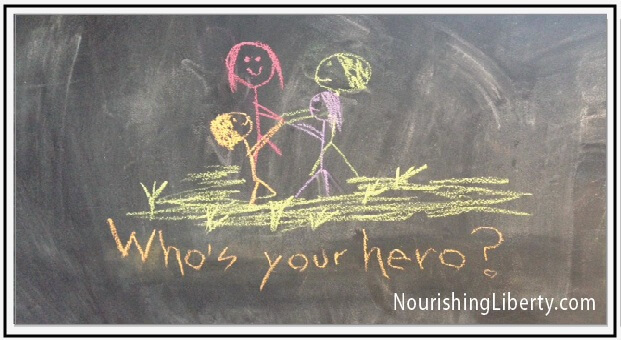 You are the new hero of the real food movement!